An international group of astronomers has detected an unusual nuclear transient in the nucleus of a weakly active galaxy. The new transient was identified by the OGLE-IV Transient Detection System and received designation OGLE17aaj. The finding is reported in a paper published January 11 on the arXiv pre-print repository. Although an increasing number of transient astronomical events in the centers of galaxies are being discovered by surveys like the Optical Gravitational Lensing Experiment (OGLE), such phenomena are challenging to detect and study. Given that transients could be explained by various violent deep-sky events, including supernovae, gamma-ray bursts, or tidal disruption events (TDEs), finding new ones is important to better understand their origin. In a recently published paper, astronomers led by Mariusz Gromadzki of Warsaw University Astronomical Observatory in Warsaw, Poland, reports the finding of a peculiar nuclear transient event in the nucleus of the galaxy GALEXASC J015624.70-710415.8, some 680 light years away from the center of the host. OGLE17aaj was detected by the OGLE-IV Transient Detection System in January 2017 and follow-up observations of this transient were performed subsequently using various ground-based and space telescopes. "We report on the discovery and follow-up of a peculiar transient, OGLE17aaj, which occurred in the nucleus of a weakly active galaxy," the paper reads. The researchers revealed that OGLE17aaj was detected at a host-subtracted I-band magnitude of about 21.0 and reached an I-band maximum magnitude of 20.0 in about 60 days. Afterward, the transient declined for about 200 days and appears to have reached a plateau. The estimated peak absolute magnitude of OGLE17aaj in the I-band was found to be 18.8. 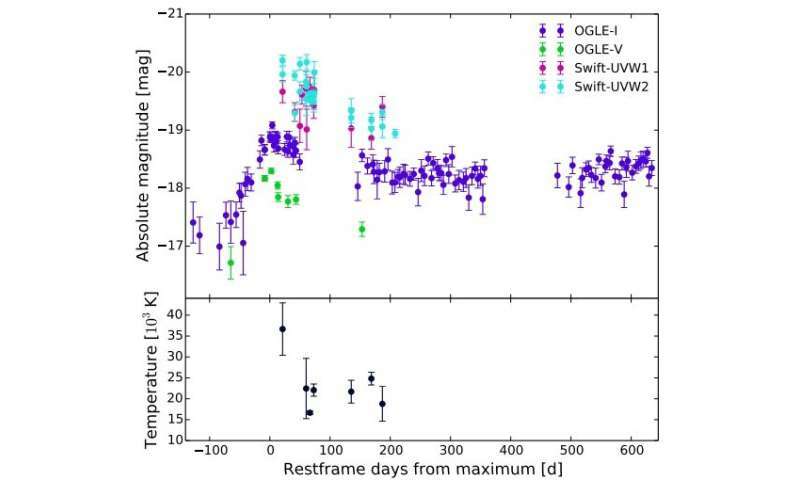 Results from ultraviolet measurements of OGLE17aaj follow the trend seen in optical observations. The astronomers noted that at maximum, the transient reached a magnitude of 19.06, and 18.52 on galaxy-subtracted images from NASA's Swift space telescope. The authors of the paper suppose that OGLE17aaj may be a TDE, taking into account its properties, such as: a long rise time, lack of color-temperature evolution, and high black-body temperature. In general, TDEs occur when a star passes fatally close to a supermassive black hole, and is pulled apart by the black hole's tidal forces. However, narrow emission lines and slow post-peak evolution of the transient, disfavor this hypothesis. "We investigated it as a potential TDE candidate based on its high black-body temperature and on the similarity of its spectrum to that of the recently reported nuclear event in F01004-2237, which was interpreted as a TDE. (…) OGLE17aaj showed a well-covered 60-day-long rise and a slow 200-day decline, followed by a plateau until day 300. This is unlike any TDE reported so far," the astronomers concluded.